The new First 40 bears a resemblance to the recently released First 45 and 50, thanks to the cosmetics of the coach house and the interior, which were penned by Nauta Design. The hull design of the new First 40 was by Bruce Farr, who opted for a hull design with a flatter mid-section than the 40.7’s, but without the distinctive chines of the 45 and 50. Although waterline length is unchanged from the 40.7, the new boat measures 400mm longer and 100mm wider. The new iron/lead bulb keel has almost identical draft to the all-lead 40.7’s, but weighs 300kg more. Overall displacement is up from 6970kg to between 7536kg and 7900kg, so, with almost identical sail area, the new First 40 has a better displacement to sail-area ratio than the 40.7. The hull appears to be mainly resin-infused monolithic polyester ’glass, with some sandwich reinforcement areas, with a FRP/balsa sandwich deck. The deck is also stiffened by an inner moulding that has integrated beams and strengthening plates at heavy-load concentration points. The deck-hull joint is mechanically fastened and bonded with polyurethane adhesive, and topped with a bevelled teak toe rails. 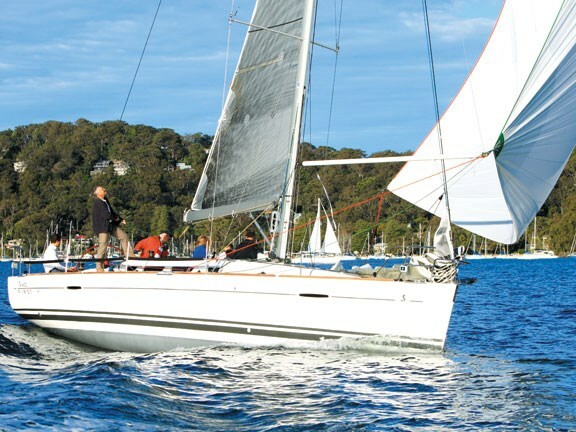 The standard rig has an aluminium keel-stepped mast with twin, swept-back spreaders, aluminium boom with fixed kicker and tackle tensioner, Dyform wire rigging, hydraulic backstay and adjustable genoa cars. The standard sail plan is for a 135 percent genoa, but the Regata packs are intended for a 106 percent headsail and a larger mainsail. 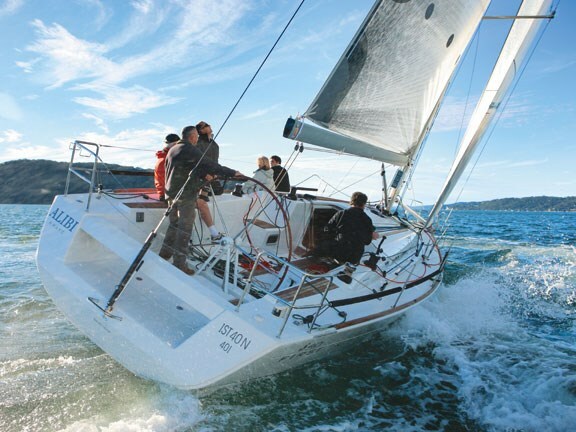 The racing rigs are 19/20th fractional, with the shrouds and the forestay terminating short of the masthead. There’s ample space for a full crew in the cockpit, and it’s possible to unclip two large cockpit lockers and leave them on the dock for extra room. The 1600mm-diameter wheel is easily centre-steered or tiller-like from either gunwale perch. Engine controls, a manual bilge pump and the hydraulic backstay ram are within reach of the helmsman. The mainsheet hand shares the for’ard end of the side seats with the helmsman, with the winches to hand on the coamings and the traveller at his feet. All six winches are Harken 44.2s and 48.2s. Sail hoist and control lines run through mast-base turning blocks to clutches or cleats and no lines run below deck. The cabin top has two shallow recesses for the lines to lie in, and "eyebrow" extensions over the coach house ports to provide more gripping area for crew feet plus shade from the sun. The companionway has a lipped entrance and there’s a flip-up, hinged Perspex panel as well. 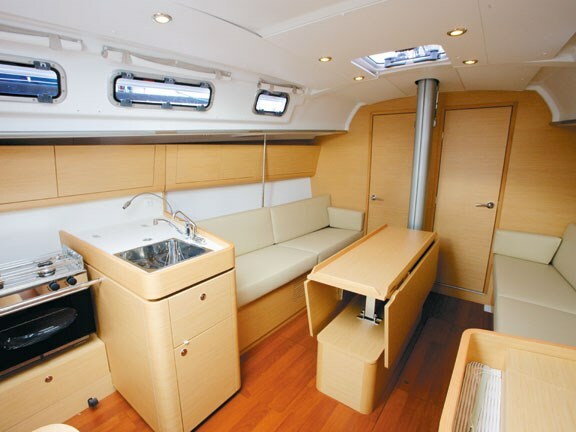 The saloon is airy and a roof hatch over the dining table and six opening ports provide ample ventilation. The dinette seats six and the drop-side table can be raised for dining, or dropped to coffee-table height. There are twin double bunks aft and a double vee-berth for’ard. 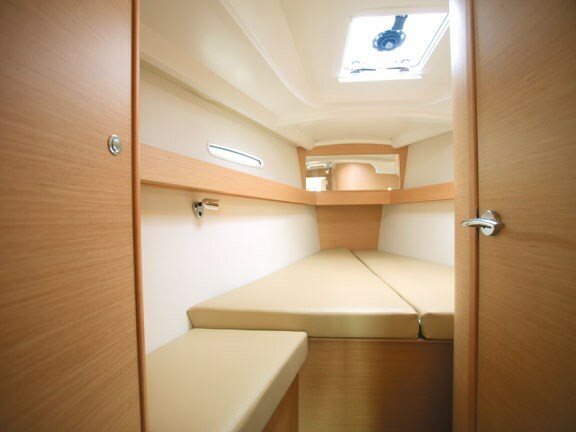 All cabins have ample wardrobe space and headroom is adequate at around 1.84m. The L-shaped galley is to port of the companionway. There’s a deep sink with freshwater mixer tap and a saltwater floor pump. The gimballed cooker has two burners and an oven. Beside the sink is the lid of the 100L icebox that can be optioned as a 12v fridge. To starboard of the companionway is the chart table area that features a retractable navigator’s seat and a swing-out electrical panel. Engine access is by way of a companionway door and sound-deadened panels in the aft cabins. The starting battery for the Yanmar 40hp saildrive is a 110amp/h unit, same for the house battery. The standard kit is a bit on the sparse side – no shorepower, no fridge, no hot water – and with less freshwater tankage than the 40.7’s, but these options can be added. We tested the First 40 in northwesterly breeze of 12 to 18kts. 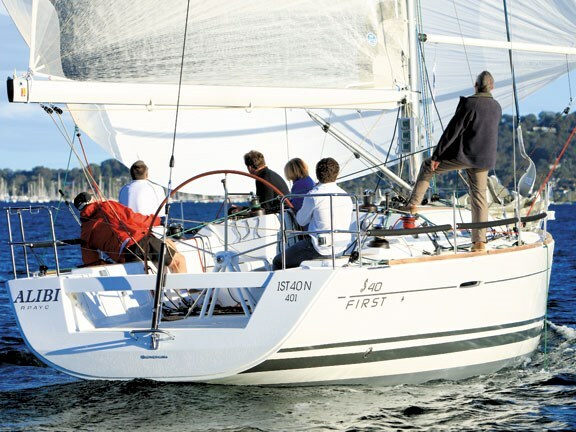 It was fitted with the optional deep keel, three-spreader rig, symmetrical spinnaker and a set of North 3DL sails. The boat steered accurately under power and proved to be easily manoeuvred in and out of the tight berths. With the sails up, it was just as easy to handle. Within a few minutes the boat was exceeding the target 6.97kts it should have been doing in this weight of breeze. Within a 29 to 31-degree range it sat between 6.9 and 7.2kts. The helm was light, but with plenty of feel and the boat could be steered very quickly to optimise power from the varying-direction puffs. There were some puffs above 20kts, but there was no dramatic reaction from the First 40. It powered up as the traveller was eased, without any tendency to round-up. The barely-overlapping headsail was much easier to control in the puffs than a big genoa. Big winches, easily handled tweakers and good vision of the bowman from the "pit" made kite gybing a cinch, but we threw in about 20, just because we could. Trimming the kite for reaching showed off the stiffness provided by the new keel design. Read in-depth boat reviews in the latest issue of Trade-A-Boat magazine, on sale now. 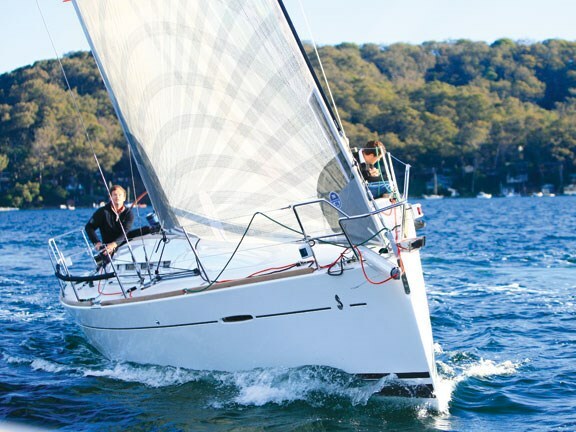 See a range of Beneteau boats for sale here.